To be very simple and direct, Sayyidina Al-Khidr is the patron saint by necessity of all those who go directly to God without intermediaries, “The Way of the Private Face”. 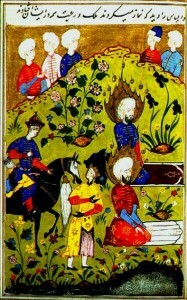 Khidr is in Islam what Elijah represents to the Jewish peoples; indeed in the Lebanon and other areas they are regarded as the same personage…and Ibn ‘Arabi tells us that “Elijah (Elias) is Idris (Enoch) who was a messenger before Noah, and whom God elevated to a high place.” (Fusus al-Hikam, Bulent Rauf’s translation, “Of the Wisdom of Intimacy in the Word of Elijah”.) …an immortal spiritual teacher who operates in the unseen worlds beyond the condition of normal life, the ever living archetype of direct Divine inspiration. Identifications with St George and St Michael are also well known, with many shrines to Khidr being sacred to all the Abrahamic religions, and ‘unorthodox’ groups like the Nusairi. Usually identified with one of Alexander the Great’s officers who drank from the water of life, he is described in the Qur’an as “one of Our servants, on whom We had bestowed Mercy from Ourselves and whom We had taught knowledge from Our own Presence”. (Qur’an yusufali translation/ 18:65). Al-Khidr is the initiator into this knowledge of those ready to receive it. The appearance of Al-Khidr is always significant. He is the initiator into the esoteric mysteries, the mysterious immortal guide who takes on the education of saints. 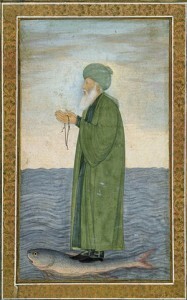 There are innumerable accounts of this immortal being’s meetings with figures like the Sheikh al-Akbar, the greatest sheikh, Doctor Maximus, Muhyiddin Ibn ‘Arabi, who encountered him three times, the first when he openly contradicted Al-Uryani, one of his teachers in Andalusia…Al-Khidr appeared and told him not to contradict his sheikh; interestingly he didn’t however say that Ibn ‘Arabi’s words were wrong. Later in the bay of Tunis aboard a ship, a bright full-moon lit night…as he looked out over the sea, he saw Khidr walking over the water towards him. On reaching the boat, Khidr stood on the sea and showed that his feet were still dry…”after that he conversed with me in the language that is special to him; then he took his leave and went to a lighthouse 2 or 3 miles away. It took him only 2 or 3 paces to cover this distance. I could hear him on top of the lighthouse, glorifying God. Sometimes he went to visit Sheikh Ibn Khamis al-Kinani.” (Ibn ‘Arabi, Futuhat al-Makkiyya. 1:186 & 3:182. Chapter 25 of the Futuhat is devoted to Al-Khidr). There is a famous Qur’anic Sura, Al-Kahf, in which the story of Moses’ meeting with Al-Khidr (never named as Al-Khidr, but accepted to be him universally in Islam) is recounted. In this story to be very brief, Moses asks to accompany Al-Khidr…Al-Khidr permits this but says that if Moses questions his actions he will have to leave him. A series of seemingly bizarre incidents follow; Moses is not able to refrain from questioning these actions (perhaps forgetting that he himself had killed a man in Egypt!). The Green One’s way is mysterious but full of a strange lightening and ascension to a different state of consciousness; all who he comes close to are secretly, invisibly, completely esoterically, transformed in their interior consciousness…I would not talk about the “Green One” behind his back…so I ask him for permission … in the religion called Islam and in much older Eastern esotericism, the “Green One” represents, is, the embodiment of the secret knowledge, intrinsic knowledge through BEING, not prophetic knowledge, as the story in the Qur’an (Sura Kaf) of Musa (Moses) and Al-Khidr makes absolutely clear. Its interesting that the Qur’an itself points to a higher knowledge completely outside the Qur’an…or the prophetic knowledge, the Ilm-i-Ladunni, “God’s Private Knowledge of Himself”, that Al Khidr is the guardian, keeper and dispenser of…the Qur’an says that “even the bees have this Knowledge” which we may understand as knowledge through BEING, intrinsic knowledge through what we are, not words. He is the guide of all those who seek closeness to The Real, without intermediary, directly; “The Way of the Private Face”. There are no hierarchies in Being. Being is Being. The ‘I am’ in all things is the same ‘I am’. Nothing ever left the Reality…there was no ‘creation’ outside the Divine…all takes place as a single thing, is a singularity divisible only in thought, but never in actuality. What interests the seeker personally is more primordial… in the direct words of Christ in “The Gospel of Thomas” (Split a piece of wood and I am there”; “Master, when will the Kingdom of Heaven come?…”Its all around you. Its just you are too stupid to see it”). In a state of Pure Awareness can YOU SEE any ‘hierarchies’? Can you see any limits anywhere? Does your Heart or your Awareness end somewhere? Where? Hierarchical systems are provisional means of explanation. But when they become ‘objects of belief’ they “limit God” and cause terrible problems, through a lack of clarity, one-pointedness. 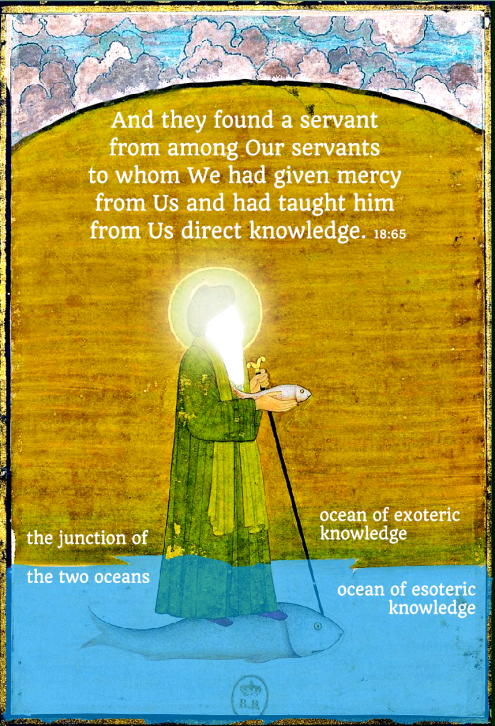 Gnosis means to go beyond all opinion and all belief into direct perception, ma’rifet, and pure faith, Imam. Mevlana said “ I lost all the religions..and then I found my religion”…but one is a pre-condition for the other. The Sura of Purity in the Qur’an says “In the Name of God, The Most Merciful, The Most Compassionate, Say He God is One, Sufficient unto Himself. Nothing came forth from Him and nothing devolved from Him. Say He God is One.” Muhammed explictly said 3 sayings of this verse were equivalent to reciting the entire Qur’an. “Brahman exists as “I am”, in every thing and every being”. The attempts to conflate direct perception with hierarchical concepts simply confuses the clarity of “There is no higher or lower in Being” (Ramana Maharshi). Ibn ‘Arabi’s Sufism is radical even in a Sufi context, for an emphasis which is remorselessly exacting on the absolute singularity of Being. It is necessary to cut through illusion and it is our responsibility to do so at all costs. It is a common human illness to be incapable except through often years of learnt discipline, of distingushing imagination, projection, wish fulfillment and other extrapolations and interpretations from what we actually experience through mystical intuition. In Sufism actually we usually take the terms “God” (Allah), “Truth/The Truth” (Haqq, Haqqiqat), “Reality/ The Real” simply as different verbal constructions from slightly different points of view OF THE SAME REALITY. We could provide many references for this … The Kernel of the Kernel for example (page 32) “This Reality in question is called in Arabic “wujud” (Existence), in Turkish “varlik” (Existence), in Persian “hati” (Existence), but in Reality, this Existence is transcendent beyond all these names. What is true is that to explain this they use the terms wujud (being), ashq (love), nür (light), nafs (self), or rahman (clemence), but that which is meant by all of these is the name of the One Being which is Haqq (Reality).” Paradoxically to Western intellectualised systems where verbal formulations proliferate, in Sufism we can usually find an increasing simplification of apparent complex terminology as we realise SOMETHING REAL WHİCH HAS NO NAME is what all the various systems are describing, and giving us a taste of. “The Way that can be Named is not the Supreme Way” Lao Tse. In the beginning of involvement in ‘Sufism’ (‘Gnosis’ might be a clearer term, direct knowledge through Being), often we are studying many things, complex systems which are quite new and different to what we knew before, Meditations, outward Zikr, Prayers…all this is a preparation and corresponds actually to Seriat /Shariah, as Self-Purification and absorption of a useful (for later stages of Ma’rifet and Haqqiqat) new world-view. It’s a preparation of the place. Later, in the stages of verfication and self-actualisation of these knowledges things become much more simple. We can only consistently remember in ordinary life a short sentence or phrase…all the complexities we met in study are largely useless to us, because though we may think we learnt them, in fact we cannot remember them in daily life, minute by minute. The degrees of Fana (Fana of Actions, Attributes, and Essence) which involved studies for years very often, become reduced in the method expounded by Metin Bobaroglu to simply trying to accord with His Goodness, His Justice, His Beauty; to act with a general principle, undefined, of being ‘Good’, To acquire the quality of being ‘Just’, to perceive Beauty consciously and intentionally. Hundreds of pages of explanations are reduced to a simple necessary action. The Bektashi say “Control your hand, tongue and sexuality“…again a simple initiation into the reality of all these words…first we must stop lying to ourselves and others. Then many internal devils will fall…because they all depend upon our unconsciousness, our willfully keeping within us a ‘grey area’ of self-justified lying. If we see someone who claims or seems interested in ‘Sufism’. and we see that still they are lying to themselves and others, we know certainly that they didn’t even begin the path. In Gurdjieff there is the concept of “putting oneself in the position of the result“. Not by any right, but with the utmost humility. Because theres no other way to the maturity and process of perfectibility of Mankind…the Insan-i-Kamil, than beginning to become moment by moment with no guarantee, with failure after failure, that Reality of being human. Its obvious why Shams-i-Tabrizi felt impelled to throw Mevlana’s books into a well…reading is not enough. The Truth FOR US is not in any book, only in ourselves, the “Book of Ourself”. And we have to begin this process, not engaging in verbal games, fake ‘sohbets’ and ‘muhabbets’ but in inner silence…Shams is “saying”…”Hey; its time to cut the crap and begin”. No one can do this for you…not the greatest teacher, not your sincere devotion, not your prayers to God as “other”…not any wonderful deep conversation, not any thought or any feeling. Khidr/ Hizir is a liminal figure par excellence. Whats the essence of the idea of ‘liminality’? We deliberately reject any interpretation- tempting as it may be- so many seek to ‘reduce’ the mysterious (and Al Khidr is an irruption of a cosmic ‘myth’) to a rational unity…maybe the most dangerously stupid of all people are the ones who cannot accept the ‘irrational’ as C.G. Jung points out in ‘Memories’, Dreams and Reflections’, and as he goes on to say, because of this will remain forever incomplete, ie, cut off from mystery and the Ghayb, the unseen). …”It is only when we are aware of our complete contradiction that we begin to really SEE”…then we have to begin to see or go insane, for all defined limits have turned to dust. C. G. Jung says Khidr reveals not just the greenness of the chlorophyll within the leaves, not just the sunlight / water responsible for their nourishment and liveliness, and not just the (secondary) green ray of light that is refracted as the “middle-pillar” within the light spectrum, but also the (primary) undifferentiated light of a pure and altered consciousness. For Jung, Khidr resembles the inner self. If we are to follow Khidr we must surrender to the inner essence of the heart of hearts that is the real teacher: “I am transcendent reality, and I am the tenuous thread that brings it very close. I am the secret of man in his very act of existing, and I am that invisible one who is the object of worship…. I am the Sheikh with the divine nature, and I am the guardian of the world of human nature…” (Abd al-Kerim Jili). “My servant, if you desire to enter into My intimacy, do not pay attention to the Mulk (the phenomenal world of witnessing), the Melekut (the world of Angels), or the Jebberut (the world of compulsion of the Divine)” Hadith Qudsi. Gilani: “Whoever is satisfied with one of these (the Hadaras, planes of Being), they are expelled from the company; – at the level of God – it is thus. I mean to say that they have lost the right of Closeness to the Divine Ipseity. Their degrees (of ascension) are stopped. But they had desired Closeness; they cannot reach that Universe in this state. Because they did not desire the thing that was essential…They had only one wing”. The Biblical Idris is Enoch (Genesis V/23) who lived for 365 years on earth, a healer, teacher, one well versed in sciences and the arts and one whom God took unto himself. The consonants of the word Enoch, mean ‘initiated’. Hebrew Hanoch means initiator or opener of the inner eye. What were the hallmarks of the teachings of the hanifs or illuminati? Laws of involutionary and evolutionary cycles. Laws of emanation and manifestation. The spiritual communion with the hierarchial Beings. The periodical manifestation of Light called Logos, Christ or Word in Christianity, Buddha in Buddhism. Teerthamkara in Jainism, is termed qutb in Islam. Ali al Hujwiri in Khashf al Mahajab writes of such a hierarchy; “Besides the Qutb or Axis of the Universe, are three called Ifuqaba, four Awtad, seven Abdal”. Ibn al-Arabi too refers to seven Abdal. The Greeks call al-Khadir, Hormux (Hermes) the adept and Initiator into the Temple Mysteries of the Great Pyramid. Isaiah 19/2 of the old Testament refers to this Pyramid Temple as the “altar to the Lord in the middle of Egypt”. 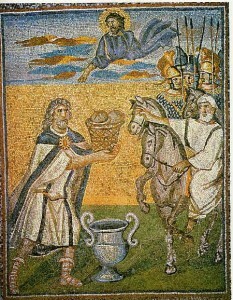 Hermes, known to the Arabs as Idris, was called Enoch by the Hebrews. Idris, Enoch, al Khidr and Hermes all seem to be one person. This guide al-Khidr initiates Moses into deeply esoteric lore. The ijnaj Ilhami, in Hadith traditions, consider al-Khadir as a holy being, mysterious and immortal whom all spiritual initiatory orders revere as the Master of the Path (Tariqa). 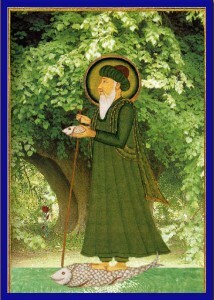 Al-Khidr is often mentioned as the Green Angel Guide in Islamic writings. 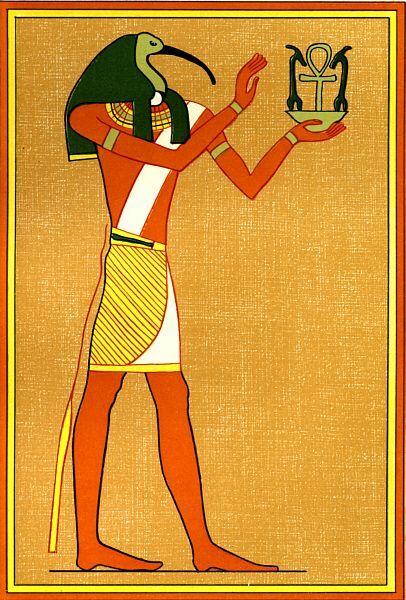 In fact, in Egyptian frescoes he, Thot, is some times painted green with the head of an ibis. Al-Khidr can most certainly be connected as the head of the ancient school of the Prophets, el-Khadoras on Mt Carmel (modern Haifa). This sacred mount in mentioned as having been handed back with endowment by Thutmose III in the 1449 B.C. documents which recorded his conquest of the region. He was a great initiate himself. Iamblichus, the Syrian philosopher, calls it the most holy of all mountains, forbidden of access to the profane. The Phophets Elijah, Elisha and Samuel are all recorded to have visited the schools for disciples at Naioth, Bethel and Jericho. Christians who delve into the Qur’an will be surprised how many old friends they find there, including Jesus and Mary, of course, and a lengthy roster of prophets and patriarchs. Exploring the Qur’an can be an excellent way of understanding the Christian and Jewish worlds of Late Antiquity, roughly the sixth and seventh centuries BC. Most of the Qur’anic characters can be identified easily enough. Allowing for legendary accretions, the Qur’anic Musa is not too far from the Biblical Moses, Adam is Adam, Ibrahim is Abraham, and Yahya is John the Baptist. With a little digging we deduce that the great prophet Idris is the Enoch who features in a couple of verses in Gensis, but who starred in countless deeply influential apocryphal books. That last example reminds us that we should be alert to seeing figures not just in the characters they assume in the canonical scriptures, but in the often vast corpus of additional writings. The Qur’an emerged from a Near East thoroughly familiar with the Bible as we know it today, but also with a bewildering collection of apocryphal books. But who is the Green Man? One very popular Qur’anic hero is al-Khidr, “The Green One,” who appears in Sura 18, al-Kahf, verses 60-82. Seeking Wisdom, Moses travels to meet “One of [God’s] servants”, whom commentators universally identify as al-Khidr (18.65). Moses, in unexpectedly meek mode, begs to follow the Servant as a disciple, despite al-Khidr’s constant warnings that Moses could not stand the pace. He seemingly commits acts of violence and vandalism, to Moses’s horror, until he eventually explains the higher purpose underlying his deeds. His apparent crimes were an illusion that even foxed the great Moses. Through Islamic history, al-Khidr has fascinated scholars and ordinary believers alike. They note that Moses treated him so respectfully, suggesting that he was very important, and perhaps a prophet, or at least a saint, a wali, a friend of God. In tradition, also, he never died, placing him in a select category limited to Idris, Ilyas and Isa (Enoch, Elijah and Jesus). In some versions, he owes this immortality to having found and drunk the Water of Life. Sufis rank him very highly as one who attained the highest levels of mystical insight. the protean figure of Khidr has a peculiar interest for the study of popular religion in Asia Minor and the Near East generally. Accepted as a saint by orthodox Sunni Mohammedans, he seems to have been deliberately exploited by the heterodox Shia sects of Syria, Mesopotamia, Asia Minor, and Albania that is, by the Nosairi, the Yezidi, the Kizilbash, and the Bektashi for the purposes of their propaganda amongst non-Mohammedan populations. For Syrian, Greek, and Albanian Christians Khidr is identical with Elias and S. George. For the benefit of the Armenians he has been equated in Kurdistan with their favourite S. Sergius, and, just as Syrian Moslems make pilgrimages to churches of S. George, so do the Kizilbash Kurds of the Dersim to Armenian churches of St. Sergius (i, 335). Muslims and Christians alike attended the same holy places, with some believers seeking the aid of George, and others petitioning al-Khidr. Qur’anic tradition often transforms well-known Judaeo-Christian heroes in surprising ways, but rarely invents characters altogether, out of whole cloth. It’s a reasonable bet, then, that the “Servant” is meant to be a figure from Jewish or Christian tradition and scripture, even if from the apocrypha or pseudepigrapha. The most important thing we know about al-Khidr is who he is not. He cannot be a Biblical figure who is named elsewhere in the Qur’an, or he would have been identified accordingly. That immediately rules out Moses (obviously), Enoch, Elijah, Jesus, and many other obvious names. Subject to that limitation, he must be a figure known in Jewish and Christian memory as a mysterious being of extreme supernatural power, one of mysterious origins, without known circumstances of birth or death. 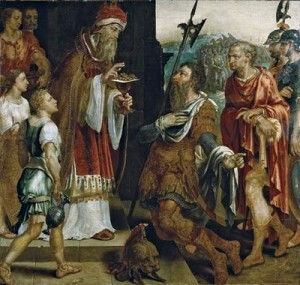 Unless I am missing something obvious, that really leaves only one candidate, and that is Melchizedek, King of Salem. (I am certainly not the first to make that point). 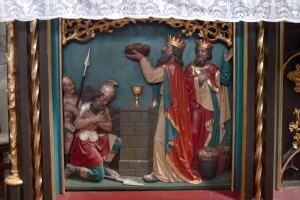 As I wrote in a recent post, “In the canonical Bible, Melchizedek appears briefly as a king and priest who meets Abraham, and blesses him with bread and wine (Gen. 14). 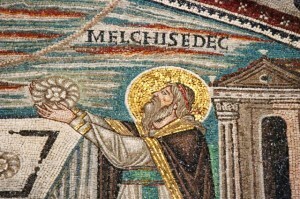 Throughout Christian history, Melchizedek has fascinated readers as a forerunner of Christ, and of the priesthood.” He features frequently in European art, usually in a Eucharistic context. 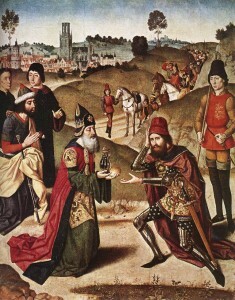 This Melchizedek, king of Salem, priest of the most high God, who met Abraham returning from the slaughter of the kings, and blessed him; To whom also Abraham gave a tenth part of all; first being by interpretation King of righteousness, and after that also King of Salem, which is, King of peace; Without father, without mother, without descent, having neither beginning of days, nor end of life; but made like unto the Son of God; abideth a priest continually. Now consider how great this man was, unto whom even the patriarch Abraham gave the tenth of the spoils….. After the similitude of Melchizedek there ariseth another priest, Who is made, not after the law of a carnal commandment, but after the power of an endless life. For he testifieth, Thou art a priest for ever after the order of Melchizedek. Hebrews makes a similar argument to what we will later find in the Qur’an. If even a titan like Abraham (or Moses) defers to this man, how enormously powerful must he have been! Muslim scholar al-Tabari quotes writers who placed al-Khidr in the time of Abraham, long before the days of Moses. Really, nobody else fits the bill. Here again, then, the Qur’an is using a Biblical figure who was vastly important in the Christian world of its time, but one who has become quite obscure to many later Christians. (He does play a critical role in the Mormon tradition). Whatever its other qualities, the Qur’an gives a remarkable glimpse of the mental and spiritual world of Middle Eastern religious believers of all kinds during a critical stage of their historical development. Recently, by the way, Ethel Sara Wolper has an essay on “Khidr and the Politics of Place” in Margaret Cormack, ed., Muslims And Others In Sacred Space (New York: Oxford University Press, 2013).